First off. This is my third book to have read on the Kindle Touch. I must say, I really like the Kindle. The e-ink is what sells it. Hands down. I have had an iPad far longer, and I was never able to embrace it as an e-reader except for comic books and for those, it is exceptional. Now, even though I like the Kindle, there are some things I am wishing would improve. I miss seeing the book cover each time I open a book. I wish in some ways, there was a way too see it more often in ebooks. Speaking of covers, another ebook gripe is publishers who don’t even bother with them. This book I am about to write about included. The cover in the Kindle edition is just the tile. Nothing more. Pretty lazy I must say. The art is not perfect looking on the Kindle, but it i still nice. The other item I miss is seeing page numbers, and see on the book (in the book? ), my progress. I like see see in the paperback my progress which you get in the percentage done on the Kindle, but it is just not the same. Lastly, I really do dig the Kindle Touch, but I wish they would add a button or two as well for page turns as an option. On to the book. 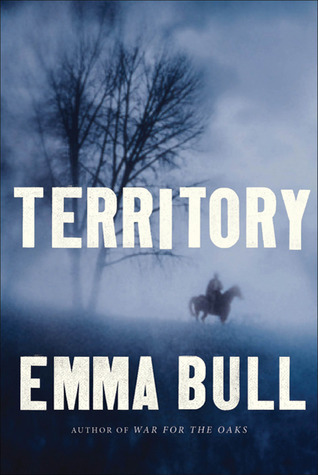 Territory is the story of town of Tombstone prior to the shootout at the OK corral. So we have the usual suspects there (Wyatt, Virgil, Morgan and Jim Earp, Doc Holiday), plus some new view point characters. As I said these are events that lead up to the shootout, not the shootout itself. I really wanted to like this book. I really did. The writing is solid, but the book just does not unfold very quickly. You get an early murder to set the story going, but after that, there is really no hint of a plot till a little over half of the book is done. After that half-way mark, we get some more inklings of what makes this story a bit different. Magic (of some nature) is thrown into this world. What this magic is, how it work, and who possess it never really covered. We just have a few characters that we no posses it. From the the half-way mark, we amble to the end. Slowly. The plot still is not making itself known. Then, in the last 2 – 3 chapters, things finally get moving. And boy does it feel rushed. In these last 3 chapters, Bull jut assaults you with information and plot resolution, but she doesn’t have enough space. In the end, I am not sad I read this. It does feel like a unfinished story. A very long prologue to the actual story. This is a compelling opening to more, but I can’t say I want to read more. I like all of the characters. I want to know more, but her meandering pacing in this book does not make we want to come back to her and read again. If a sequel does happen, I will have to see what mood I am at the time. This entry was posted in Reading and tagged alternate history, reading. Bookmark the permalink.